I’ve never been the sort to afford myself any kind of adventure. Sure, I’m a fixture at local concert venues and bars since shows and pub trivia take up a good majority of my free time, but there is a special emphasis on the word “local”. My radius for activities is a rather small one less because of my city is a bustling epicenter of interesting activity and more because I’m pretty much a giant chicken. Simply put, the motto “Better safe than sorry” has summed up a good majority of my life. The last time I did any sort of traveling for a show was around four years ago. My ex and I hopped into his Blazer and made the trek to Schroeder Hall in Goliad, TX to watch Seth James and Randy Rogers Band in what we promised to be the first of many out of town trips to watch the bands that we loved. Now, one thing that I think I need to properly convey is that when I say “trek to Schroeder Hall”, I mean that Google maps puts the door-to-door time from my house to the parking lot of Schroeder Hall at an hour and 45 minutes. So in actuality, our drive wasn’t a terribly long and trying one. Since then, I haven’t really been able to make the run for the sake of the show. I spent years waiting tables and working long hours, which never allowed me to make the trips I wanted to, whether they were to see a show or just get out of town for the day. I fell into a restrictive mindset that I wasn’t going to be able to get out of dodge like I truly wanted to, so I resigned myself to only attending goings on in my local area. Sure, this was fine when I was working evenings and couldn’t attend a number of things – but when I finally got a steady, Monday thru Friday job, I suddenly found myself with an abundance of free time in the evenings that I was unsure what to do with. So, I made the executive decision to rediscover the music I loved so much by going to as many shows as possible. Even after weeks of watching both old standbys and new favorites, I felt something lacking. I’d lamented my lack of adventure when American Aquarium was in Texas at the end of October, but never felt the staggering urge to ever do anything about it. Sure, I dreamt of one day climbing in my car and heading North with the only intention being having a story I could one day tell with a mischievous glint in my eye, but what was the likelihood that I would ever do it? Being the type who spends 9 hours a day behind a desk listening to certain artists so many times that it feels like I know them on a level that’s only reserved for close friends, I knew the chances of me ever taking that kind of chance was slim. Then came November 29, 2013. I’d found out earlier on in the week that Lincoln Durham was going to be in Houston the day after Thanksgiving and immediately had the internal debate – should I try to go? Would my nearly-decade old car make the 7-hour round trip? Did I have enough money for coffee to keep me awake? I’m fairly notorious for the self-induced psyche out. I’ve managed to talk myself out of more events than I care to admit simply because I was afraid of what was going to happen. So, at 26 years old, I finally decided to do what I’d wanted to do for a long time and make the journey to Houston to see the artist I’d been binge-listening for almost two straight weeks. After an oil change and a top off of the gas tank, I put the address to Fitzgerald’s in my GPS and drove. After what seemed to be an eternity of waiting, the doors opened and eventually, the opening act played. Lucas Gorham, a local Houston act, seemed to have a fondness for making music in a similar fashion to Peter Frampton with the heavy use of a talk box and an electric guitar. I’ve got to hand it to him – Gorham seems to really enjoy what he does. Very seldom can you find artists who put a great deal of passion into their music, and Gorham is definitely one such artist. So is Lincoln Durham. 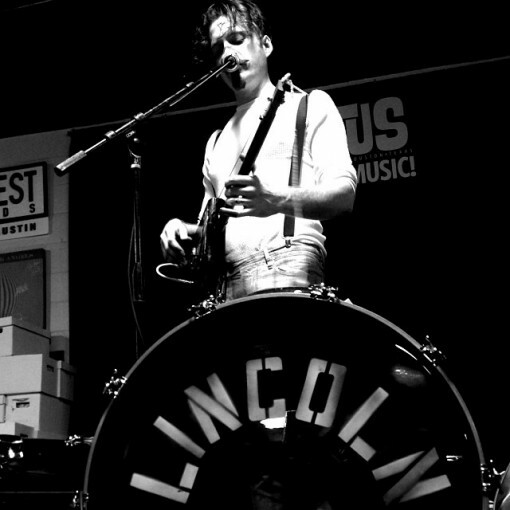 If you’ve never had the privilege of seeing Lincoln Durham play, I feel I should let you know that the man is versatile. Starting out a set playing a suitcase is a bold move, and Durham manages to make you forget that it’s luggage rather than a percussive instrument. He manages to make an entire evening of swampy, gritty music that forces you to listen to anything he has to say. Durham utilizes kick drum, acoustic guitars (one of which has “PARDON MY GRIT” in white spray paint on what can only be described as the belly of the guitar), cigar box guitar, banjo, and, yes, a suitcase. Watching an artist like Lincoln Durham is a brand new experience for me. It takes a great deal of endurance and concentration to be able to play multiple instruments at the same time, but Durham does it with conviction and a great deal of grace. I made a post-show stop to the merch table and left with a koozie (as is tradition for me) and a tshirt (with thanks to Tank). Walking outside, I took a look up at the sky on a slightly chilly November night. I had a long drive home, but the trip was more than worth it. I left Houston headed south with ringing ears and a story to tell of the time I didn’t psyche myself out and made the run for the love of music. Took that plunge a couple years ago when I realized the travel was not a big enough hurdle to keep me from seeing all those hard working bands that keep me entertained and love to get that live support .. Kudos to you for seeing it through and experiencing Lincoln live .. When I first heard him I told the friend that recommended “Wow, he’s is great” the friend followed up with “That’s nothing, wait till you see him live”. A couple weeks later I was making a 6 hour trip to experience that. ck5e8B Wow, marvelous blog layout! How long have you ever been running a blog for? I just want to say I am just all new to blogs and definitely enjoyed you’re web page. Likely I’m want to bookmark your website . You surely have exceptional writings. Appreciate it for revealing your website. Hello there, I discovered your site via Google whilst looking for a comparable subject, your site got here up, it seems to be good. I have bookmarked it in my google bookmarks.